Senior Class of Webber Township High School Heads to Branson, Missouri, Thanks to Travel Fairy Godmother Stephanie Abrams; Country Surroundings in Galway City at Westwood House Hotel, Galway, Ireland; Actor, Humorist, and Leprechaun Malachy McCourt Heads to Roundstone, Ireland in Summer 2011. 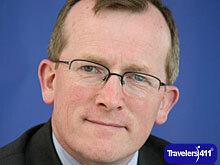 Dave Kelly, General Manager, Westwood House Hotel, Galway, Ireland. Malachy McCourt, actor, author, humorist, leprechaun, New York, NY, USA.